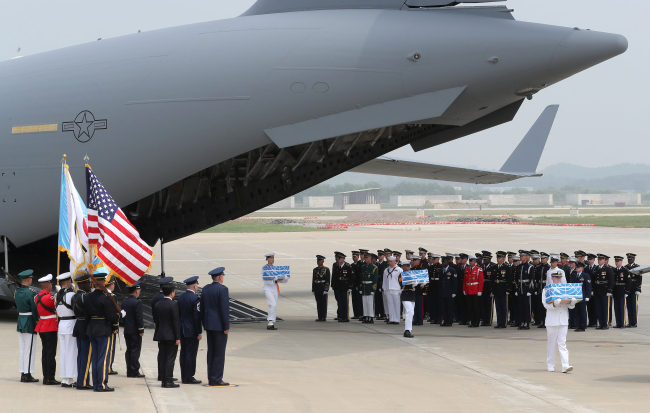 The United Nations Command and North Korea on Friday discussed jointly excavating the remains of American soldiers killed in the 1950-53 Korean War and repatriating them to their families, a government source said. The two “held general-level military talks today at the truce village of Panmunjom to discuss the issue of repatriating the remains of American soldiers killed in the Korean War,” the source said on condition of anonymity. It is said that Maj. Gen. Michael Minihan represented the US-led UNC in the talks, and his North Korean counterpart was Lt. Gen. An Ik-san. In July, the United States and the North held general-level talks to discuss repatriation of American soldiers killed in the war. Following subsequent talks, the North sent back 55 sets of war remains to the US. The move was part of an agreement reached by US President Donald Trump and North Korean leader Kim Jong-un during their summit in June. During Friday’s talks, the two sides are said to have exchanged views on also jointly excavating remains of war dead in North Korea. About 7,700 American soldiers are unaccounted for from the Korean War, and about 5,300 of them are presumed to have died in North Korea. A total of 443 sets of remains of American soldiers had been sent back to the US from 1990, when the North started excavation of war remains on its soil, until 2007. It is said that the US had provided about $22 million to help the North’s work during the period.